This emotionally expansive, visually lush novel would have been irresistible as a screen project for producer Ross Hunter and director Douglas Sirk, fifty-plus years ago. Although Margaret Bradham Thornton’s first novel takes place during the early 1990s, it could have been adapted in the 1950s by Hunter and Sirk. If the book contains any profanity, it’s difficult to recall. There are some sexual encounters, but those are mercifully nonexplicit, in the manner of the camera panning to a fireplace with burning embers, or to roiling ocean waves. The story centers on two Charlestonians, although the cast of characters extends to what seems like 100. Eliza Poinsett and Henry Heyward, both in their early thirties, experience a chance encounter at a wedding in England, about a decade after their break-up, which has transpired for a mightily significant reason. Eliza, who has earned master’s degrees in English and art history, has been working and studying in London, editing and contributing to scholarly works. Similarly, author Thornton won recognition for editing Tennessee Williams’ “Notebooks,” and she places references to Williams’ poetry and plays into her narrative. Indeed, her book is replete with literary references, both stated and allusive, particularly pertaining to the derivation of characters’ names. Well, “Henry” and “Eliza” do stare the reader in the face, for instance. As for this novel’s HH, he’s up to his rolled cuffs as publisher of the Charleston newspaper he inherited from his father, and is also seeking the acquisition of other print properties to augment his publishing “chain.” Remember, this is the early 1990s, when such newspaper chains were flourishing. When Eliza and Henry have their twist-of-fate meeting, she is beached on a rocky promontory in her relationship with a British documentary filmmaker. Meanwhile, Henry has a passion for photography. Eliza is evidently drawn to men who interpret the World through visual media, as do the painters she studies. Eliza flies solo to Charleston, where Henry places himself front-and-center in her daily landscape, forcing her to re-explore her feelings for him, while she re-analyzes her scholarly writing. She also undertakes new studies of two South Carolina artists, including Dave—the Edgefield slave potter who sometimes etched enigmatic verses on his pieces. Thornton, ever the meticulous researcher via her protagonist, references The Edgefield Advertiser in her text. As aforestated, a director with a gift for the visually lush and romantic—Todd Haynes did a fine job carrying on Sirk’s torch in “Far From Heaven”—could bring out the panoply of tints and tones in the novel’s emotional palette. One quibble here: “Charleston” doesn’t fit the story as an entirely satisfactory title. This seems to be more of a marketing ploy, designed to target the “beach-read” group that turns to Mary Kay Andrews, Anne Rivers Siddons, Karen White, and some much-lesser writers than they for summertime sustenance. 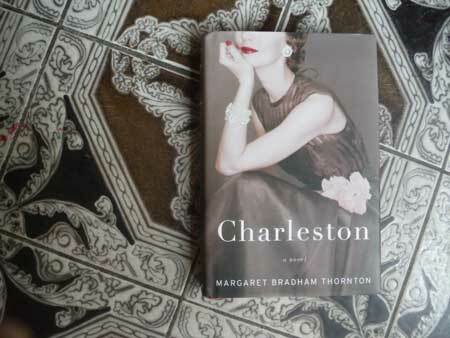 For Thornton’s book is much more in line with what the New York literati term “literary fiction.” Yes, Charleston holds court in allDavid Marshall James its wrought-iron-fenced splendor as the story’s setting, a place that has undoubtedly shaped the two main characters, both of whom “escaped” to Ivy League universities. However, in the final analysis, the story is that of Eliza and Henry, not of Charleston. The title “A Curve of the Rain,” or “Where the Rain Curves,” taken from an important scene in the novel, as well as subsequent symbolism therein, would have better suited book. Well, maybe for the movie. One Response to "Book Review: “Charleston” by Margaret Bradham Thornton"
When I finished the novel I felt I had taken a trip to Charleston and met the special characters, none more charming than Henry, who does his best to get Eliza back. It is a lovely story written beautifully.